If it's not Halloween, yellow skin and eyes may not be the look you're going for. When levels of bilirubin, a byproduct of red blood cells, get too high, it can lead to jaundice, or yellowing of the skin. Elevated bilirubin is not common in adults, but it does happen and is usually due to an underlying illness involving the liver such as cirrhosis, hepatitis or Gilbert's syndrome, an inherited disease, according to MedlinePlus. No special diet will help lower bilirubin levels, but following a healthy diet that supports liver function may keep levels within normal range. Consult your doctor if you're concerned about bilirubin levels and liver health. Your liver processes the nutrients you eat into energy and filters out toxins in your blood. Eating a diet filled with nutrient-rich foods can help your liver function properly and may help your body better process bilirubin to keep levels within an acceptable range. Nutrient-rich foods for a healthy liver include whole grains; fruits; vegetables; lean sources of protein such as fish, poultry and beans; low-fat dairy; and healthy fats such as oils. A diet high in fiber is good for your liver, says the American Liver Foundation. It helps your liver by promoting the regeneration of its cells, according to a study published in 2005 in the "Journal of Enteral and Parenteral Nutrition." Women need 21 to 25 grams of fiber a day, and men 30 to 38 grams. Fruits, vegetables, whole grains and beans are all good sources of fiber. Eating 2 cups of fruit and 2 1/2 cups of vegetables each day can help you meet your daily fiber goals. 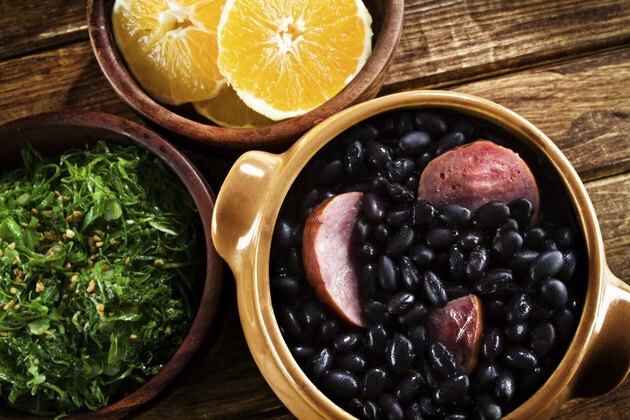 With almost 10 grams of fiber in a 1/2-cup serving, beans such as black beans or kidney beans can be added to salads, soups and whole-grain side dishes to up your intake. Lycopene is a naturally occurring chemical and antioxidant that gives certain fruits and vegetables their red color. According to a 2004 review article on antioxidants and liver health published in "Critical Reviews in Food Science and Nutrition," eating more lycopene-rich foods may be beneficial to liver health. Guavas, watermelon and cooked tomatoes contain the highest amounts of lycopene, with more than 6,000 micrograms per 1-cup serving. In fact, tomato products, such as tomato juice and tomato paste, are a significant source of lycopene in the U.S. diet, according to MedlinePlus. Other good sources of lycopene include papayas, grapefruit and cooked sweet red peppers. Limit your intake of foods high in unhealthy fat such as fried and fast food, and foods with added sugar such as soda, cakes and cookies. Getting high amounts of unhealthy fat and sugar in your diet may increase fat deposits and inflammation in your liver. The American Liver Foundation recommends you limit your intake of salt as well. Alcohol can also damage the liver, so women should have no more than one alcoholic drink a day and men no more than two. A healthy bilirubin lowering breakfast might include a bowl of high-fiber cereal -- look for cereal with more than 2 grams of fiber per serving -- with low-fat milk and half a grapefruit. For lunch, you might enjoy a chicken and veggie stir-fry -- add sliced sweet red peppers for lycopene -- with brown rice and a small apple. A healthy dinner option might include turkey meatballs with whole-wheat spaghetti and tomato sauce, mixed greens and steamed broccoli. American Liver Foundation: So, What Healthy Foods Should You Eat?